Evidence suggests that small and medium-sized businesses (SMEs) rely more on bank credit than other businesses. So how has their cost of borrowing fared since last year’s Bank Rate cut? And how do their rates compare with overall businesses? The new effective rates data for SME loans , which include a split of floating rate loans by reference rate, can help to answer these questions. 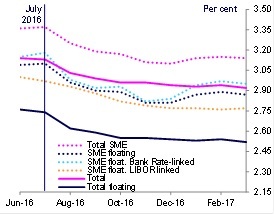 Overall, rates on all SME loans (the dotted pink line) have fallen by a similar magnitude to the rates charged to all firms (the solid pink line). The effective rates on total floating-rate business loans (the dark blue line) have fallen by 0.22 percentage points (pps) since July. As a result the wedge between SME rates and those to all businesses has remained roughly constant, at around 0.30pps. Effective rates on outstanding Bank Rate-linked loans to SMEs (the light blue dotted line) fell by 0.20pp in August – meaning that virtually all of the 0.25pp Bank Rate cut was passed through within a month. Most Bank Rate-linked loans have a daily reset, so are impacted immediately. Bank Rate-linked loan rates have started to increase slightly since the start of 2017, due to higher rates on new loans. Libor-linked loan rates to SMEs (the orange dotted line) reacted less quickly, as more of these loans have a reset period of more than 3 months, though the overall fall between July and December was of a similar size. Hannah Phaup works in the Bank’s Data and Statistics Division. Next Post Bitesize: Which fixed-rate bond term is most popular?